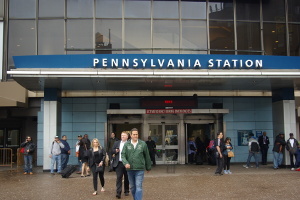 Existing entrance to the Penn "rabbit warren"
According to the union representing NJ Transit's conductors, more than 240,000 fares went uncollected on NJ Transit's trains last year, apparently due to crowded trains and lack of staffing. According to a letter the union sent to NJT, the uncollected fares might represent $5.5 million in lost revenue. The story was first reported by the New York Times (by Emma. G. Fitzsimmons, and printed May 8), and quickly picked up by other media. 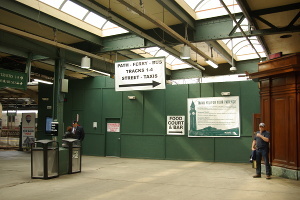 The Times story also reported that NJT will have to pay about $1 million in fees to other transit operators for "cross-honoring" arrangements in which NJT riders can use non-NJT services in emergency conditions; the relationship of this to lost ticket revenues was unclear. The data were from forms filled out by the train crews, reporting uncollected fares. 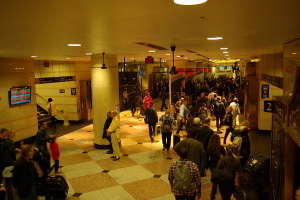 While many riders may not have had their tickets inspected, the worst crowding typically occurs in peak hours, when most riders use weekly or monthly passes; not checking such riders does not incur any loss in revenue. In addition, an increasing fraction of single-trip riders now purchase and activate tickets on their smartphones; these "e-tickets," as well, don't need to be inspected as they are already paid for. In many transit systems, onboard ticket inspection is not regularly performed; in those systems, tickets are not sold on board trains or buses, and only random inspections are done: riders caught without valid tickets typically incur heavy fines. Such systems are already familiar to users of NJT's light rail lines, and on the "Select Bus Service" lines in New York City. If NJT's rail lines were to be converted to this "proof-of-payment" system, any losses might well be reduced. But this might also require fewer onboard workers, which might not be something the train conductors' union would welcome.